Hauskaa lauantaita, tervetuloa Allsorts haasteen pariin! Viikon aiheena ainoastaan neliöt , ei soikeita eikä pyöreitä, eikä edes suorakulmaisia muotoja! Hi; Happy Saturday, it's time for a new Allsorts Challenge! DT Kath's theme is " Be there, or be Square" only square shapes. I used blue colour under everything, so the shadows are more efficient! Tämä kortti on myytävänä Sisustuskahvila Wanha Justiinassa, Karjalankatu 3, Lahti. and to check out all the fabulous inspiration from my very talented team mates. Very pretty with a lovely vintage feel Mervi, the lace finished it perfectly. So very beautiful Mervi. Love your coloring! Aivan uskomattoman kauniisti väritetyt kukat. Upea kortti! 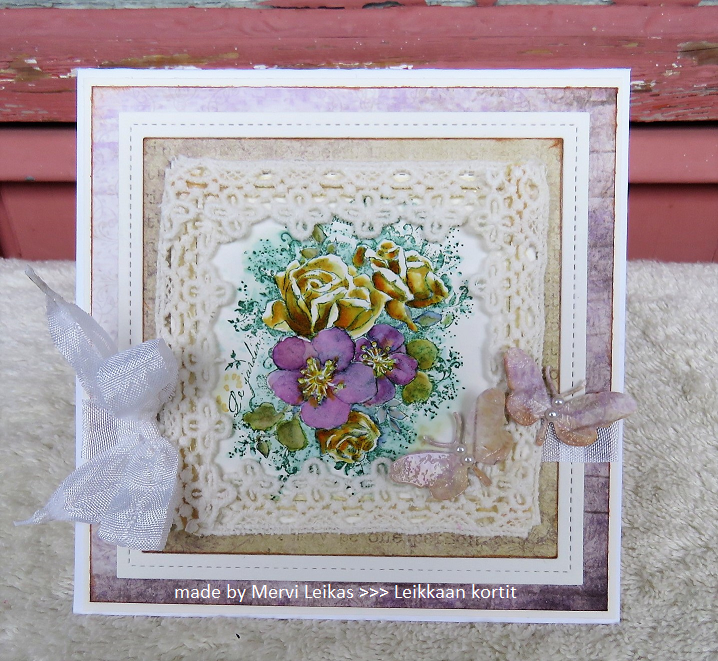 A really beautiful card for my challenge Mervi and the fact that you have used so many squares, gorgeous image and design. Thank you. What a beautiful, soft feminine card Mervi. Love the colours and all the layering you've done. Beautiful! Thanks for sharing your beautiful card with us at the "Feminine" Anything Goes challenge at the Watercooler this week. It's me again stopping by again to thank you for sharing your beautiful floral card at my Crafty Wednesday challenge this month! Also loving your new blog look! Hello & thanks you for playing along with us at Papercraft Challenge, I love your square challenge. 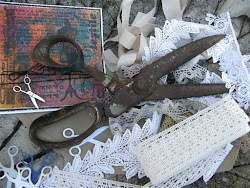 The colouring you did is exceptional, and I love the image with the vintage lace. It is a great combination. Its beautiful. Beautiful creation Mervi! Thank you for sharing with us over at Let's Craft and Create. We hope to see you again. 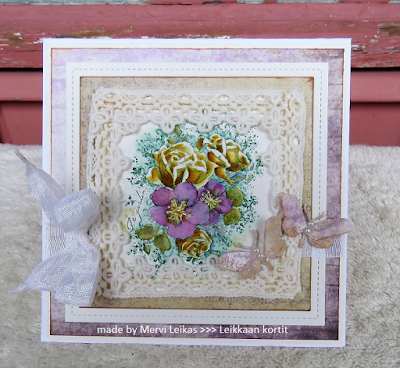 Beautiful card, Mervi! I like the way you've colored those flowers. Thanks for joining us at the Watercooler Wednesday Challenge. Marsha DT. Be sure to join in on the fun with our Papercraft Business Challenges! next time! So gorgeous, lovely details and design.. So pretty love it Thank you for sharing with us over here today at the Classic Open Design Team Challenge and best of luck with your entry. Such a gorgeous card... I love how you 'famed' it up! Everything about this is so pretty Mervi. Wow! A wonderfully card composition! Beautiful the flowers. Thank you for sharing it with us at Crafting With An Attitude. Love your floral panel, love your colours and pretty layers too! What a sweet and elegant project. Loving the layers and the fun dies you've used. Thanks for joining us this month and hope to see you for our upcoming challenges! This is beautiful art and craftmanship! Thanks so much for joining us at Papercraft Business Challenge #5. I hope you visit again for our #6 in May. So pretty! I just love the dies you used - it sure made the project pop!!! Thank you for joining in on the fun with our Papercraft Business Challenges!